"She does not cover her hair – most American Muslim women don't—and she's going through a rebellious phase," Wilson continued. "She wants to go to parties and stay out past 9 p.m. and feel 'normal.' Yet at the same time, she feels the need to defend her family and their beliefs." Wilson is an accomplished author who wrote several issues of Superman comics and recently won the World Fantasy Award for her novel "Alif the Unseen." More importantly, Wilson is Muslim. A memoir of her conversion, “The Butterfly Mosque,” intimately expresses the beauty she finds in her faith. That level of complexity bodes well for the Khan character, whom Wilson says will wrestle with her faith. Sana Amanat, an editor at Marvel Comics has said she also wants the comic-book character to struggle with difference, a common teenage concern made especially poignant by the currents of Islamophobia running through many parts of the United States. "As much as Islam is a part of Kamala’s identity, this book isn’t preaching about religion or the Islamic faith in particular," Amanat has said. "It’s about what happens when you struggle with the labels imposed on you, and how that forms your sense of self. It’s a struggle we’ve all faced in one form or another, and isn’t just particular to Kamala because she’s Muslim." 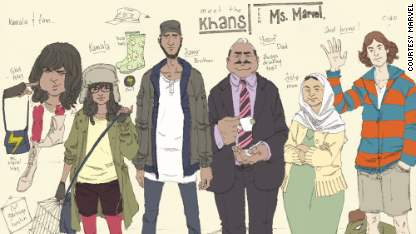 Kamala Khan, the new Muslim superhero, and her family. The emergence of the new Muslim Ms. Marvel highlights an increasing sophistication in the ways Muslims are shown in popular culture, a shift led by comic books. But I’m happy that we may finally see a Muslim character whose faith is not the only part of her life that matters. I want to read about a young woman/Superhero who deals with the ordinary ordeals of being a teenager, battling her bratty brother and forging her own identity for the first time. The cover art Marvel Comics has released hints that Khan will be a sophisticated character. She is holding books about art, religion and history and is wearing a scarf around her neck – notably, not her head. A bracelet wrapped around her wrist appears to feature Arabic script. My hopes for Khan are buoyed by the fact that Marvel Comics, the publishing company that will release Ms. Marvel in February, has a solid track record of confronting controversial issues, including religion. Issues such as homophobia and the AIDS epidemic have been addressed through characters such as Northstar, who came out of the closet in 1992. Anti-Semitism is another recurrent theme in the Marvel universe, with characters like Magneto being shaped by his experience of the Holocaust, and Kitty Pryde struggling as a descendant of Holocaust survivors. After years of cardboard representations of Muslims, the character Dust, aka Sooraya Qadir, joined the X-Men in 2002. In 2011, we found out that another of the X-Men, M, was raised as a Muslim. Although it took nearly 17 years for her religiosity to be revealed, M eventually challenges xenophobia by questioning protesters at the site of the so-called "ground zero mosque," asking them what it means to be American, and who gets to decide. DC Comics introduced the first main comic-book character who is a Muslim born in America, Simon Baz, aka the Green Lantern. Unfortunately, because he is part of the Justice League, a larger team, his appearances have been infrequent since his introduction in 2012. The character of Kamala Khan has the opportunity to offer something new to pop-culture portrayals of Muslims. She is born in the United States, appears to be part of the post-9/11 generation and is a teenager. In the end, I hope the most interesting thing about the new series is the writing, not the fact that the character is Muslim - and not the fact that a small number of Americans seem to have a problem with that. So far, the folks in my Twitter feed seem more upset that Kamala Khan is from New Jersey. Hussein Rashid teaches at Hofstra University in the department of religion. He is an associate editor at Religion Dispatches, a term member on the Council on Foreign Relations and fellow at the Institute for Social Policy and Understanding. The views expressed in this column belong to Rashid. MALALA should be the superhero with superpowers to counterattack Muslim terrorists and stop bullets, resist bombings, beheading and punish ped^0^philes such as emirs, caliphs, sultans and Islamic clerics. Iislam ain't that healthy either. I like the idea of a Muslim girl being a hero, but I'll miss the old Ms Marvel. She was also a vet, an alcoholic and a very strong leader. Why not keep the other complex character while making the new one? The Old Ms. Marvel (Carol Danvers) is still in Marvel Comics taking on the decades old mantle of Captain Marvel. well that sounds cool; the only thing i truthfully know about mrs.marvel is rogue drains her dry and she ends up in a comma for like ever...............well atleast that's the animated reason rogue has mrs.marvel like powers. A 16 year old Muslim girl... and she isn't married yet... geeze, she's practically an old maid... past her prime. Ok, now that was funny Micky. Good one. With att etudes like this, is it any wonder why so many Muslim kids feel alienated enough to become extremists? What's wrong with giving Muslim kids a positive role-model? Is her costume a suicide vest? Your an adiot and stupid for being alive! People like you shouldn't even be consider alive. God burn you in he'll with mercy! The irony in your post is beyond amusing. Minorities are the heros, whites are the villians. Even though in reality the opposite is usually true. Who would have guessed Stalin and Hitler were minorities? New Muslim-American superhero.......Kamala Khan; she changes into Ms. Marvel and stalks the streets of New Jersey to brutally beheading infidels for Allah!!! Malala should be the superhero with superpowers to repel bullets, acid attacks, mutilations, bombings and beheading. In addition, with the courage to confront emirs, caliphs, sultans, Islamic kings and clerics to strip them from their absolute power, immense wealth and liberate thousands of Muslim women and concubines from these S^0^B's. If she's a US Muslim, she wouldn't have encountered any of that, as almost all Muslims worldwide do not.